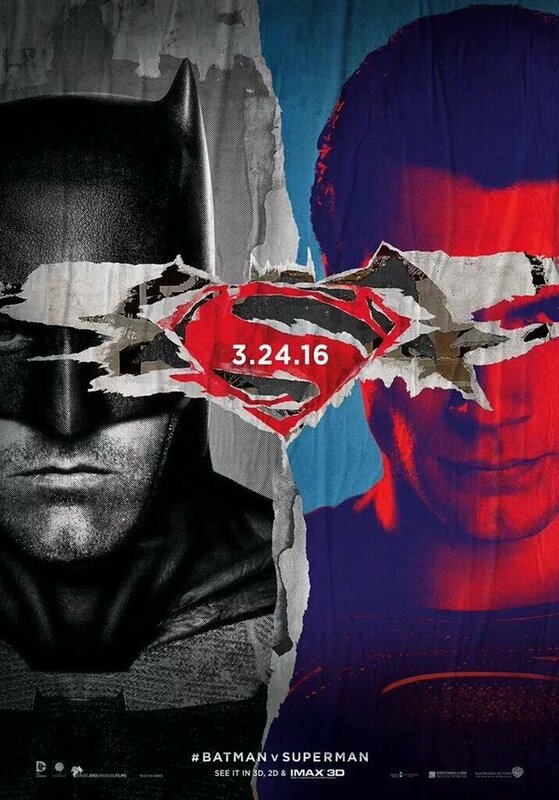 Batman v. Superman: Dawn of Justice is built on the promise of a fight. It’s not Batman and Superman, its Batman verses Superman. The iconic DC Comics’ characters have to get punchy because director, Zack Snyder; screenwriters, David S. Goyer and Chris Terrio; and the head honchos at Warner Brothers—betting this will launch a 10-year plan—demand they fight; it’s just they forget to come up with a reason why they should come to blows. The true rivalry at the core of Batman v. Superman is different films in one jostling with each other for attention like a litter puppies crowding for their mother’s teat. Batman v. Superman picks up after the events of Man of Steel and Snyder smashes open the film by showing the final battle from Man of Steel between Zod (Michael Shannon) and Superman (Henry Cavill) from Batman/Bruce Wayne’s (Ben Affleck) perspective. Snyder has Wayne charging through 9/11 imagery—people witnessing mid-air collisions, skyscrapers falling and smoke engulfing streets—designed to overemphasise this comic book inspired universe will never be the same again. Of course, the floating spaceship and flying men already establish this seismic shift but Snyder has to exaggerate the horror of our collective memories of real tragedy. From the opening of Batman v. Superman it begins to work as a reactive video essay to the events of Man of Steel, mainly focusing on the human cost of Superman’s actions as witnessed on the ground by Wayne, and it does make an impact despite the embellishment. Outrage culture begins to take aim at Superman and for a brief moment it seems like Batman v. Superman has a chance to reflect on the impact of the Man of Steel’s emergence as a God-like figure. The conversation about Superman is laced with xenophobic fear, the politics of super-powered justice and mankind’s history following false Gods. Debate rages in the media about the best course of action, academics have written books about Superman’s arrival and Nancy Grace even makes an appearance to embed superheroes in the 24-hour news cycle. Cavill’s turn as Superman is still all cape, hair and chin, but he’s allowed moments of doubt when Superman begins to question his place on Earth and the nature of what it means to be a hero. The dour tone of Snyder’s execution in Batman v. Superman lends itself to scrutinising the concept of costumed heroics and the destruction they can cause. Once Wayne shows up in the bat-suit and starts branding crooks like cattle with his logo and firing bullets out of every gadget, you’re firmly in the realm of a menacing vigilante to hammer in the point. Even a scene where Martha Kent (Diane Lane)—traditionally the American moral compass of Superman/Clark Kent—leans to the cynical side of the situation when she tells her son that he doesn’t owe the people of Earth a damn thing. Ma Kent’s contempt may speak volumes about the modern attitudes of the American Midwest, only just recently a law passed that made it legal for college students in Kansas (Superman’s home state) to bring guns to class and a legal bill is in the works to that offers students a $2,500 bounty to hunt for transgender people in bathrooms. Worry sets in when you realise Ma Kent could possibly be an anti-vaxxer in Snyder’s interpretation and it’s these kinds of ideals that undermine the outlook of Batman v. Superman a little. Sure, things may have been a little saccharine when Richard Donner’s Superman: The Movie hit in 1978 but it’s hard to fathom Snyder’s interpretation of Superman ever coming close to embodying the moral code of ‘truth, justice and the American way’ when these notions have been decimated over the past 30 years in America. In Batman v. Superman we’re getting the shards of what’s left of these beliefs and a glimpse of the sacrifices that have to be made in order to enliven a glimmer of hope, and that becomes the embodiment of Superman’s arc. None of this contemplation lasts long (roughly a 15 minute window of 153 minutes) in Batman v. Superman before the plot turns into a round of back-room whispers of ‘he said, she said’ orchestrated by Lex Luthor (Jesse Eisenberg) who has an annoying habit of arriving in each scene with maniacal musical accompaniment (Junkie XL and Hans Zimmer scoring the film in ALL CAPS). Eisenberg seems to be acting alone is his own film where Luthor is Willy Wonka, but the odd thing is: he seems to be the only one who embraces how silly it gets and can’t be faulted for deciding to drink alone like a wayward guest at a lame party; he makes his own fun. In comparison, Affleck delivers an older, stoic Wayne, full of regret, but it always seems like there’s an assistant under his nose with smelling salts to keep him awake. The moment when Affleck’s Batman bursts conscious is when he appears to be in his own movie with one spectacular raid on a warehouse sequence where the Dark Knight takes down armed goons in free flowing combat that’s brutal and angry. The confrontation between Batman and Superman is completely inconsequential because they bicker for the sake of bickering as if to fulfil the purpose of a film title nobody wanted to budge on. The battle begins a wave of destruction that anesthetises any genuine thrill. Snyder’s direction is so haphazard throughout Batman v. Superman that it’s tough to make out what’s happening during a majority of the action sequences (aside from the one Batman fight scene out of 153 minutes) and it becomes worse when the film spasms with gigantic outbursts of digital effects, especially around the Doomsday creature that looks like a cheap Lord of the Rings import. Thankfully, Diana Prince/Wonder Woman (Gal Gadot) arrives like a soothing balm late in film after spending a majority of Batman v. Superman attending parties, driving sports cars, getting on planes and checking her emails—yes, this is a film where superheroes spend large chunks of time sending emails and watching videos. Amidst all the banality of Batman v. Superman, Wonder Women is completely “whatevs” about the situation and it subtly mocks the male fracas. The most exciting takeaway from Batman v. Superman is the promise of Wonder Woman’s solo outing due in 2017. Once Gadot suits up as Wonder Woman she takes pleasure in combat that borders on sadomasochism, amplified by the way Snyder shoots her in various sexualised positions that’s similar to the way female characters are drawn on comic book covers. Gadot’s physical performance manages to avert the sexualisation away from exploitation of those infamous covers. In one action beat Wonder Woman leaps from her back with the pelvic fury of an Amazonian warrior fresh of hearing Beyonce’s Formation. Wonder Woman is empowered by Gadot and her femininity plays a big part in the way she slays. Wonder Woman also makes the world of Batman v. Superman feel larger and there are other surprises that work the same magic; while Batman and Superman pummelling each other somehow makes everything feel smaller. Batman v. Superman suffers big time due to its commitment to serialising the story as it builds its expansive DC comics universe across multiple films, and that explains why it feels like each element is competing for attention. Batman v. Superman is like choir made up of soloists forced to sing together, and when nothing harmonises, Snyder ups the ante until the sound is disorientating enough for you to consider accepting there’s something of merit. Batman v. Superman ends up being disjointed, numbing and spectacular with its intemperance. Thanks for reading the review. That’s one of the points of film criticism. If you want a review that’s just biased blissful fanboy ranting with nothing to ponder, then there are plenty of other outlets that will provide sufficient ‘lols’.